As you drive through the village of Muthill on your way up towards Crieff, the road turns sharply to the left, and on the corner is a churchyard with a big oak gate and flowering cherry trees. If you’re quick, you get a brief glimpse of a ruined church with soaring arches and a magnificent, square-built tower that points heavenwards like some kind of medieval skyrocket. My attention has been caught by this amazing sight so many times over the last few years, but just recently, on a perfect April morning, we finally stopped to take a look. The tower at Muthill (pronounced Mew-thill) is what strikes you first, possibly because of its pleasing shape and symmetry. It is described as a ‘fine Romanesque bell tower’, and when it was built, which was around 1150, it would have been free-standing; the church came later. Some interesting claims have been made about the Culdees. They are said to have carried with them some secret, sacred knowledge; and they are linked with the builders of the Temple of Solomon in Jerusalem. One source says that, when Viking raiders laid waste to St Columba’s settlement on Iona, they spared the small church of St Oran which (it is thought) was the home of an early Culdee monk. The tower would have contained a bell that called the monks to prayer, and it would also have served as a place of refuge when the monastery was under threat. At present, I can’t find any description or suggestion of the monks’ residential quarters. I don’t know how many of them there were, but I can’t imagine them living in a claustrophobic and almost windowless tower. It would be wonderful to go back in time and see just how they lived, what they did, what they believed. Details of their early lifestyle are hazy, but modern-day Culdee doctrines refer to a ‘love of nature and a passion for the wild and elemental’; and ‘a love of selfless acts, vigils, spiritual adventure, pilgrimages… holy wells, mountains, caves, ancient monastic sites and other sacred locations’. They were ‘theologically orthodox, yet with heavy emphasis on mysticism’, and were apparently influenced strongly by the Druids. 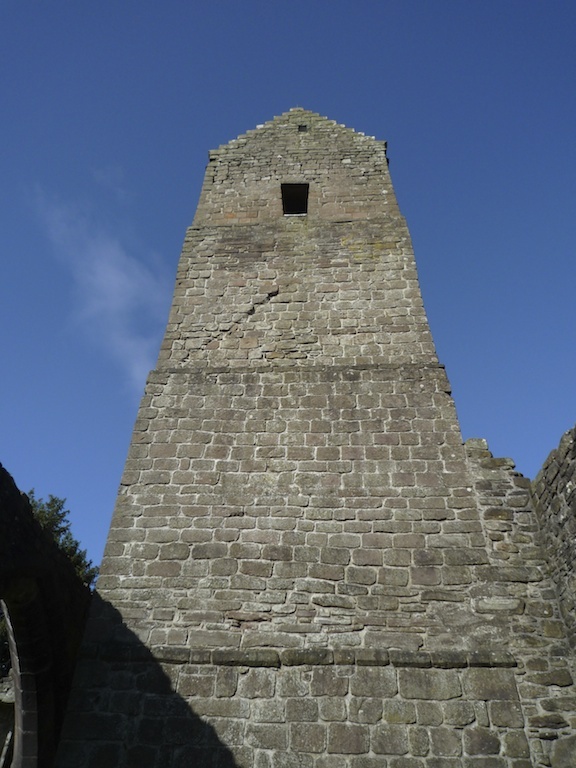 Canmore, the RCAHMS database on Scotland’s historic monuments, states that the nave and chancel of the church “belong mostly to the early 15th century.” The church has been added on to the tower so that at, first glance, it appears part of the structure. It is believed to have been commissioned by the Bishop of Dunblane, as some of the architectural details are similar to those of Dunblane Cathedral. 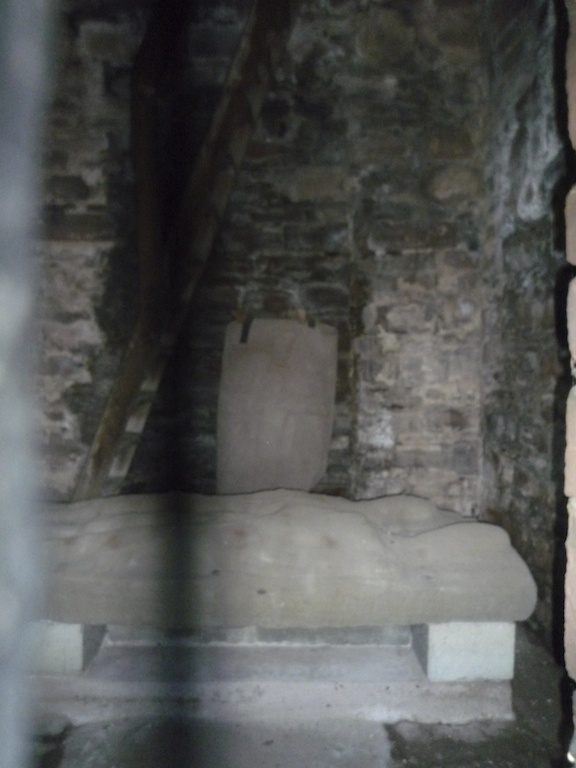 The information board at the entrance gate said that inside the tower was a 12th century Christian cross-slab along with the effigies of Sir Maurice Drummond of Strathearn and his wife, Ada. Sir Maurice fought alongside Robert the Bruce at Bannockburn, and died around 1362. I love looking at early gravestones, although effigies do sometimes give me the heeby-geebies. However, the big iron-studded oak door to the tower was firmly locked. A tiny window with metal bars yielded a limited view of the dark interior, and so I put the camera up against it and clicked. The weather-worn effigies and the upright gravestone showed themselves in the photo, but there was little in the way of detail. I had hidden hopes of disturbing something other-worldly, having tried the heavy door handle quite loudly several times. According to one source, “there is no evidence of provision for a stone stair within the tower.” Any stairs must therefore have been wooden, perhaps with the bell ropes hanging down a central core. There are also no signs or mentions of the existence of different floor levels or storeys, so I imagine that the tower was hollow except for a staircase. In fact, on studying the photos, I can see some kind of stepped pattern in the outer stones of the upper section – so maybe there were stairs on the outside. Around the church were some interesting gravestones with carvings that related to the person’s occupation, alongside some rather grim depictions of skulls, crossbones and the sands of time. 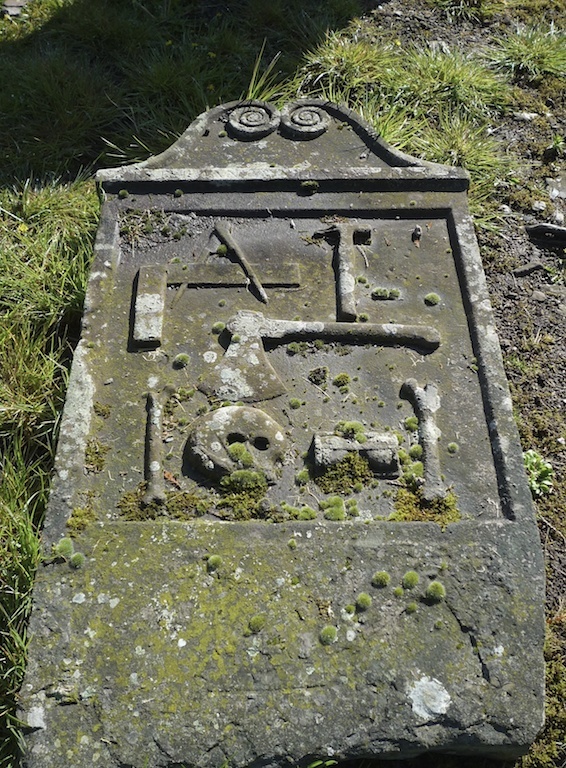 I’ve seen these kinds of headstones in several places, including Skipness, but I’ve never found them outside Scotland. 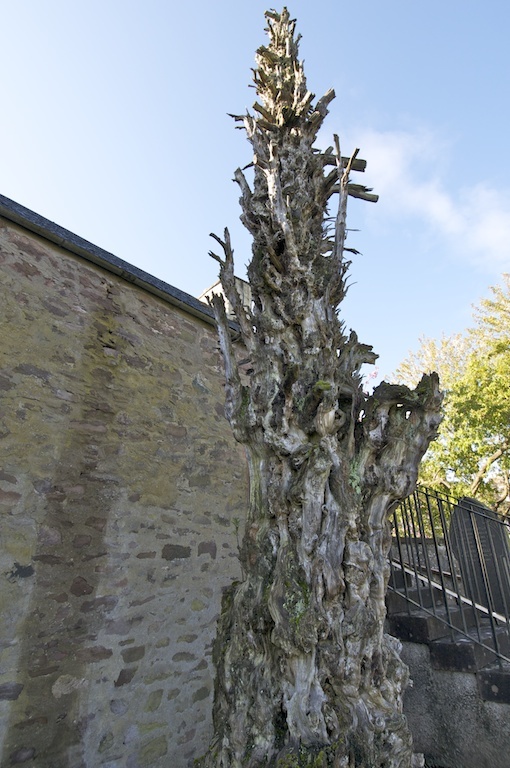 We were interested to see the tall trunk of a dead tree, most probably yew, which is whitened and gnarled with age; it has obviously been left well alone on purpose, presumably because of its connection with the early church. Yew trees can live for centuries, but this one may, of course, have been struck by lightning. (I think ‘beadsmen’ refers to men or servants of the church). 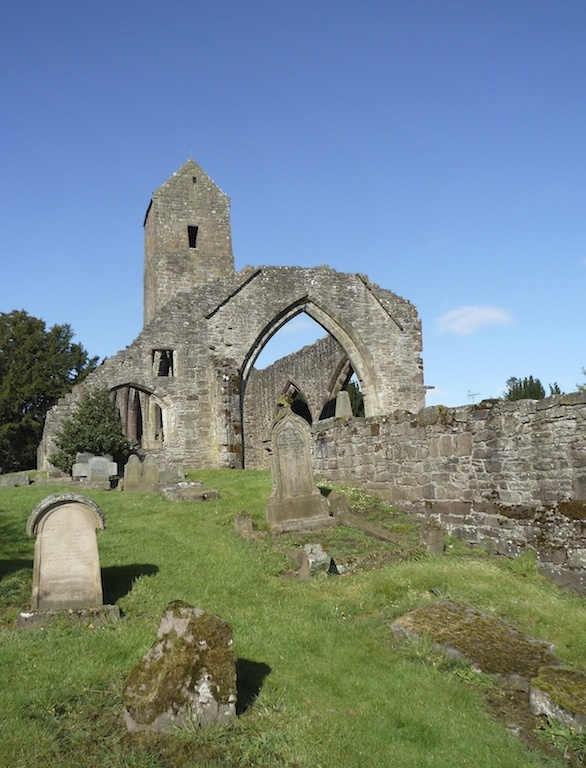 The church and tower are the only remnants of the old village, which was destroyed by soldiers retreating after the Battle of Sheriffmuir in 1715. This was the year of the first Jacobite uprising, when the Earl of Mar raised the standard for James Francis Edward Stuart, the ‘Old Pretender’ and father of Bonnie Prince Charlie, against the newly-crowned Hanoverian King, George I of England. The battle is described as being inconclusive, but the rebellion eventually ended in defeat. Most of the buildings in the present-day village date back to the late 1700s. The name ‘Muthill’ has received some interesting explanations. One source says it comes from the Gaelic ‘maothail’ meaning ‘skin softening’; another says that it derives from the old English ‘moot hill’, a place of judgment or decision-making. Such hills were common in medieval England, and they were also surprisingly widespread throughout Scotland. The website Gaelic Place-names suggests that it is derived from the Gaelic for ‘soft place’, evoking a sense of peace and serenity which seems much in accordance with the Culdees’ way of life. Muthill seems to epitomise what I love most about lesser-known historical sites: they are just there, dreaming away in blissful solitude alongside 21st century life, overlooked by coach parties of tourists, an everyday but extraordinary sight. The Old Church remained in use until 1825, when a newer one was built; both the church and tower are in the care of Historic Scotland. Admission is free. If you’re interested in the Culdees, take a look at the the wonderful tower of St Rule in St Andrews. 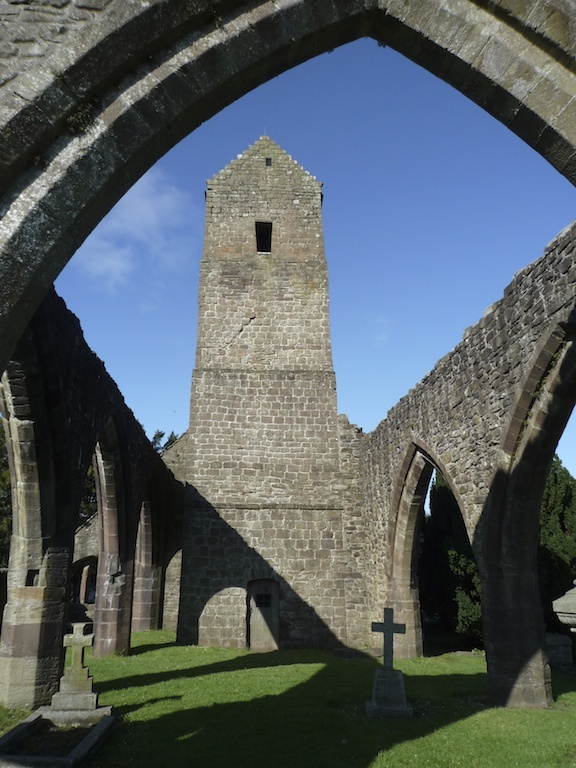 It was built by a community of Culdee monks and dates from about the same time as Muthill. What a splendidly blue sky and most interesting information, as always. I didn’t know any of that about Culdees, but I know the name because there’s a tearoom called ‘Culdees’ in Abernethy. There’s an interesting looking tower in Abernethy that I’ve never been into, but after reading your article here I did a quick Google search and discovered that the tower was built by Culdee monks around 1100. I always learn something fascinating from this blog Jo, you continue to enlighten and educate me in the most marvellous manner! You’ve also whetted my appetite for a visit to Muthill Old Church. Thank you, Lorna! I was very interested to know about the Abernethy tower, and I looked it up online. Very interesting that it’s round in contrast to the square one at Muthill! I’ve never even been to Abernethy, but I did find out that there were several other Culdee settlements throughout Scotland – one of them at St Andrews. I think I would like to have talked to some of the Culdees – their beliefs and practices appeal to me. Super photos Jo! Indeed it looks like the perfect weather for photography and touring. Love your history lessons! I know, the blue sky looks too good to be true! It really was perfect. Thank you for your comment – I really enjoyed researching and writing about it, too. It’s a lovely old place, and there’s more to it than first meets the eye. Thanks for your comment! I’m surprised at the suggestion that Maothail is supposed to mean ‘skin softening’. My understanding is that it means ‘tender and soft or quiet and peaceful’. This would suit the fact that it was a Culdee settlement perfectly. It certainly matches the pronunciation given for Muthill. The ‘moot hill’ suggestion I don’t believe at all. This was a Gaelic speaking area and the surrounding place names bear testament to that. The photos are excellent incidentally.